A complete HRMS Solution that saves HR efforts by automating tedious tasks and managing entire employee life-cycle. "Available on every device anywhere anytime." The made modules provided are easily customizable to fit your HR needs, its fast, its very easy to use, its cheap even for small businesses to acquire, it is compatible with all operating systems and also has the web-based platform making it more mobile and flexible to use for managing employees in different branches, it has a very wide usage in that it covers all HR tasks as well as other departments bringing all the tasks under one log in which reduces the number of man power required, most of its fuctions like reporting are automated a capability that has reduces paper work. They offer a free demo for new users. Slow technical service team, they are not to depend on for emergencies or urgent problems. HR-One is the perfect tool to use as a HR department because it is all inclusive. It covers all areas of HR and it's cheap compared with other HR software that offers only few features. 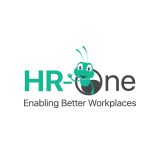 HR-One generally covers all HR tasks from recruiting, onboarding absence and leave management to payroll. It made the entire HR department autmatic because many tasks are automatic including responding to common questions from clients. It is also a great CRM tool. Its very cheap at only around $3 for small package, its compatible with many devices both mobile and desktop versions, the apple is available in both Google Playstore and apple store, free trial, has packages based on customer needs and cost. All inclusive features for all HRs, self service feature for employees. Slow customer support, the self service feature is sometimes slow. Time management and attendance tracking, performance tracking for purposes of offering performance based incentives. "Helps store and organize HR information in an efficient and user friendly manner"
Helps store and organize HR information in an efficient and user friendly manner. Allows for employees to easily retrieve their personal information and for management to document and retrieve any HR related information they need. Allows for easier overtime calculation and payroll management. The software was expensive compared to other options, however it offered our company most of what we needed (78%) ft after the needs analysis. "The simple way to do HR tasks." Easy to use, very easy to customize, affordable, provides an easy way to track performance and provide incentives, they offer induction making your work easy as HR. Sometimes it may be slow I don't know the reason and when I questioned support the answer they gave did not help. if they improve support I believe all other problems would not exist. Task management, tracking employee performance. * We monitor all HR-One reviews to prevent fraudulent reviews and keep review quality high. We do not post reviews by company employees or direct competitors. Validated reviews require the user to submit a screenshot of the product containing their user ID, in order to verify a user is an actual user of the product. Hi there! Are you looking to implement a solution like HR-One?